doorbell rang the other afternoon. dozen eggs dozing there, asleep in two rows. one, the palest shade of green, laid by a south american mama chicken. all the rest, variations on caramel. or these days, you might say variations on mocha skim latte. it’s not everyday eggs come rolling to your door. not in the dead of winter. but not everyone knows the egg lady. seems, apparently, that i do. name’s carol. and she delivers the fruits of the hen. she was out making her rounds. she had a dozen for sophie, the nail lady at some chic little shop. another dozen for marge, who scrubs faces. and a dozen for pablo, who cuts hair. and then there was me. unannounced, without warning, i was the proud owner of twelve organic, whole-grain-fed eggs. i am quite sure my heart wouldn’t have pounded harder if ol’ ed mcmahon himself had come to my door, thrust cardboard check in my hand. i mean, i am a girl who dreams of an egg-laying mama with feathers. i even have her a name: lady chanticleer. it’s only the town laws keeping her and her hay from me and my make-believe farm. i could not get over their beauty, the eggs. ‘specially the green one. so pale it merely whispered of green. didn’t come out and hit you over the head with it. certainly wasn’t the easter-egg green my boys thought that i meant, when at dinner i opened the lid, showed off the twelve apostles, awaited the chorus of oohs and of ahhs. i’d been told by the egg lady that the yolk was really the thing worth applause. so first thing next morning, i cracked one, two, then three. i applauded, all right. the yolks were like sunrises, all golden, towards orange. round and taut and knowing right where they stood. not the so-so yolks from the grocery store shelf, the ones that wobble and ooze with the softest prick of a fork. i sizzled the trio in a bath of french butter, nothin’ but the best for these babies. frothed them a bit, gave them time to regroup, then i rolled their new ruffly selves onto a plate. my boys nearly licked it. well, you don’t go worshipping eggs without knowing a bit about who did the laying, so i put in a call to the egg farmer himself. denny wettstein’s his name, lives down in carlock, illinois, down in the mackinaw river valley, smack dab in the heart of the heartland. denny and emily, that’s the farmer’s wife, have nine children and about 350 laying hens right here in the middle of winter. they’ve got 500 acres they farm, organically. they’ve got cattle and sheep and goats and pigs, even turkeys until mid-november. until it’s time for the turkeys to lay down their heads for our overstuffed tables. in the spring and the summer, their egg-laying flock grows to 2,000, but that includes plenty of meat birds, as denny puts it, meaning the ones you slather with sauce and toss on your grill. the egg-layers, they are the lucky ones. they live as long as they lay. now these hens are not cooped up in some cold crowded apartment. nope. they live in a heated house, thank you, where they can imbibe of warm water and feed 24 hours a day. like an all-night diner. and denny tells me, the chickens, what with their feathers, don’t mind the cold. but they are rather finicky about snows on their feets. i asked denny how he likes his eggs best, and he gave me the recipe for egg-and-cheese casserole. when i inquired as to how many eggs i might want to crack for this casserole, he chuckled. told me at his house they use two dozen for breakfast. but then, he reminded, he’s putting eggs in nine little mouths. you might not need two dozen for your crew. here’s how denny does breakfast: crack eggs; add cheese, grated; toss in chopped onion, peppers, sausage, potatoes, whatever stirs you; stir. pour into buttered casserole. let sit in fridge overnight. pop in 350-degree oven come sunrise. bake for 40 to 45 minutes, you’ll have to keep an eye on your eggs. but then, if they’re denny’s, you’ll want to. 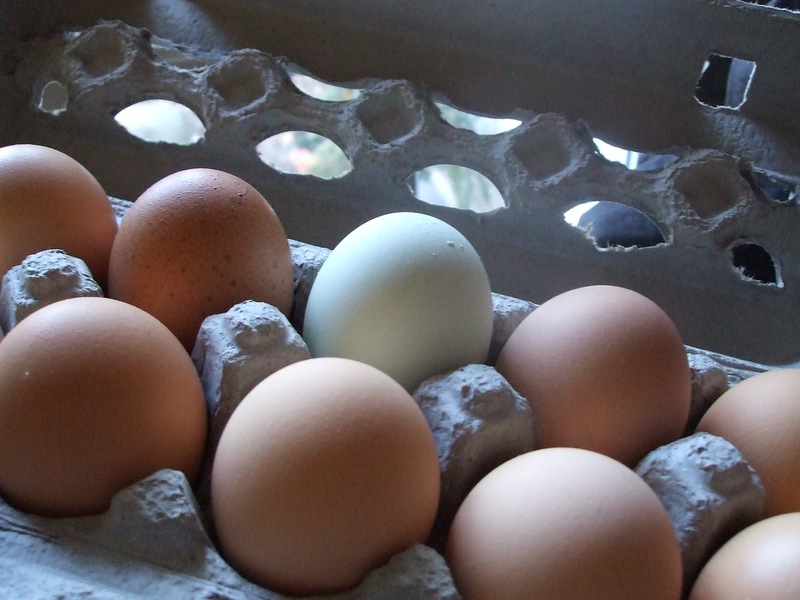 the wettstein’s amazing organic eggs are coming to oak park this saturday. they’ll be at the buzz cafe, by the dozen, from 1 to 3 in the afternoon. they’re $4 a dozen when they make the trip up to chicago. but if you want to drive down to carlock, turn in at the farm gate just off u.s. highway 150, and grab a dozen out of the ice box on the wettstein’s front porch, they’re a steal at $2.50 a dozen. the ice box is open six days a week. buzz cafe is at the corner of harrison and lombard, a whole lot closer than carlock. tell denny hullo for me. There is something so nice in knowing from where one’s food comes. From the Wettstein Farm to our plates. And yes, the eggs DO taste better. And, the yolks DO center themselves and shine like the sun from the pan. 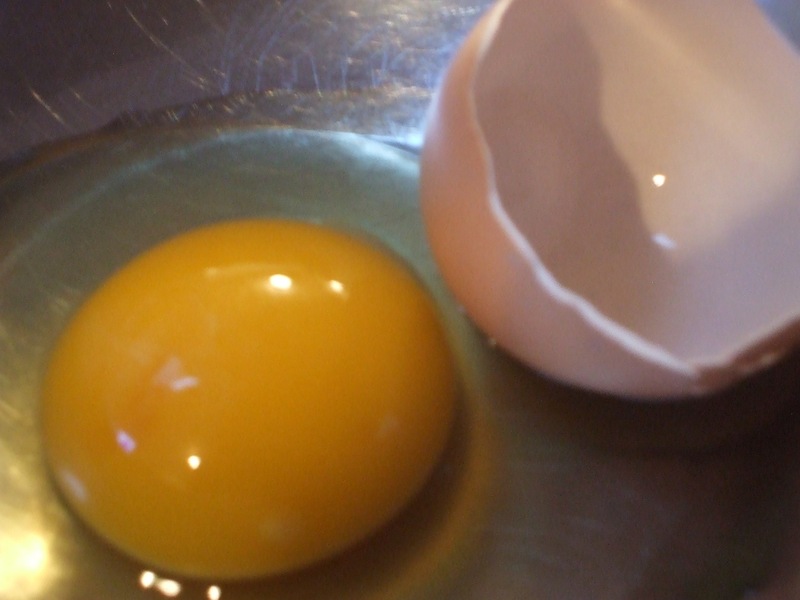 Isn’t it nice to get excited about something as small and overlooked as an egg? Happy Day! Carol delivered a dozen eggs to me too! I ate my green-shelled one hardboiled and it WAS very good. (Hardboiling instructions: Place cold water, salt and egg(s) in a sauce pan. Bring all to a boil. Cover pan, turn off heat and wait 12 minutes for the perfect hard-boiledness.) I think this is so interesting – the new word-of-mouth marketing of produce from the farm. It’s really kind of a phenomenon – using high tech blogging and e-mail and internet to get people to know about and appreciate low tech and simple things like farm-fresh eggs. I like that new voice on the blog–VVPV. Lots more bloggers are coming. A busy blog this will be. More tables! More chairs! With my husband out of town and 2/3rds of my children elsewhere for dinner. I made French toast for my youngest and an omelette for me. But I’m missing those gorgeous eggs Barbara wrote about. Any ideas for those of us who are nowhere near Oak Park? I miss the farmer’s markets so much in the winter, but if we could get a good egg, that ease our wait for produce that actually tastes like something? ?